Summer is here, which means temperatures are rising! 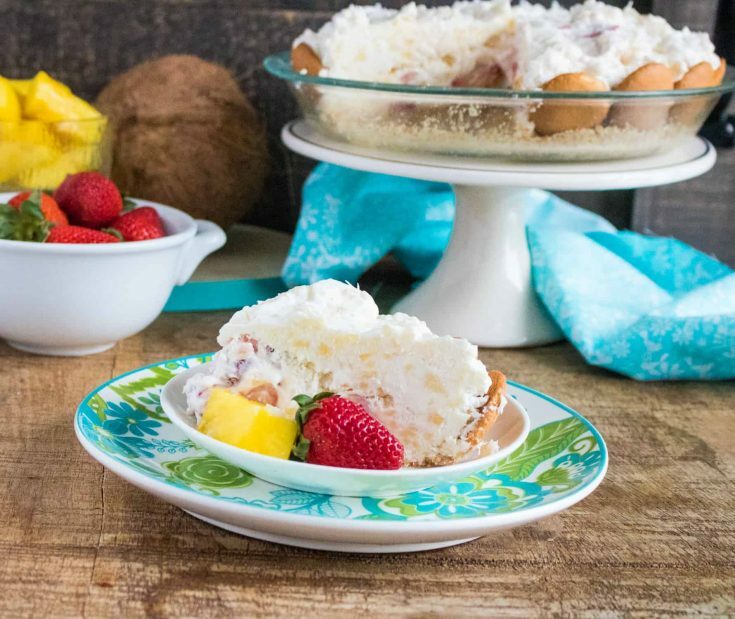 This No-Bake Tropical Cream Pie is a delicious and refreshing way to cool down. Plus it’s quick and easy to make, so it won’t take much time away from soaking up the summer fun. 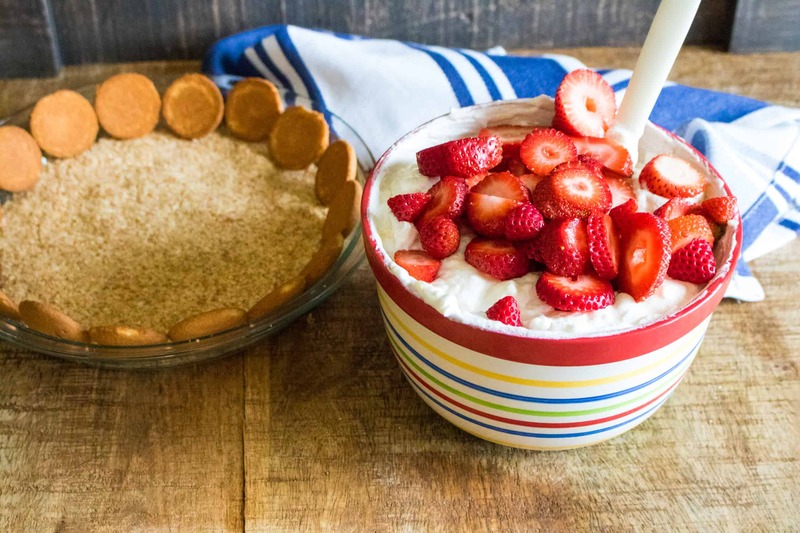 And a no-bake dessert is the perfect solution when you dread having to turn on the oven. 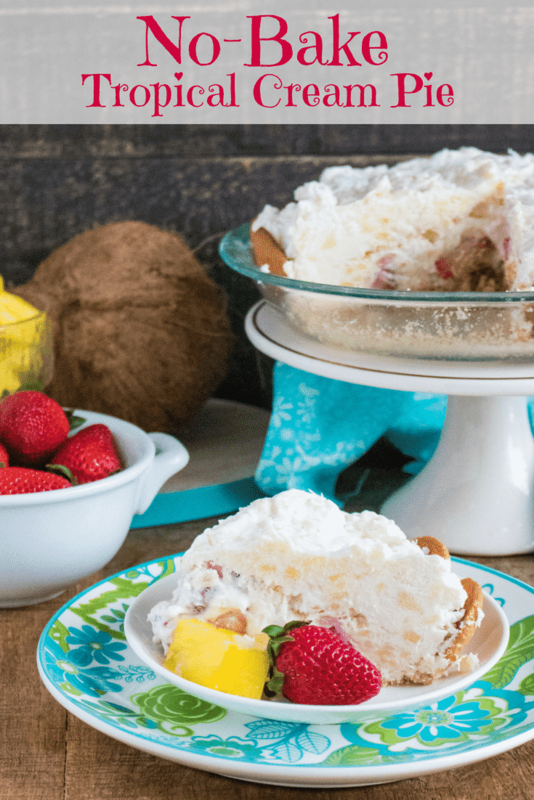 Summer desserts should be refreshing, and No-Bake Tropical Cream Pie certainly fits the bill. It is no-bake, so no heating up the house with a hot oven. 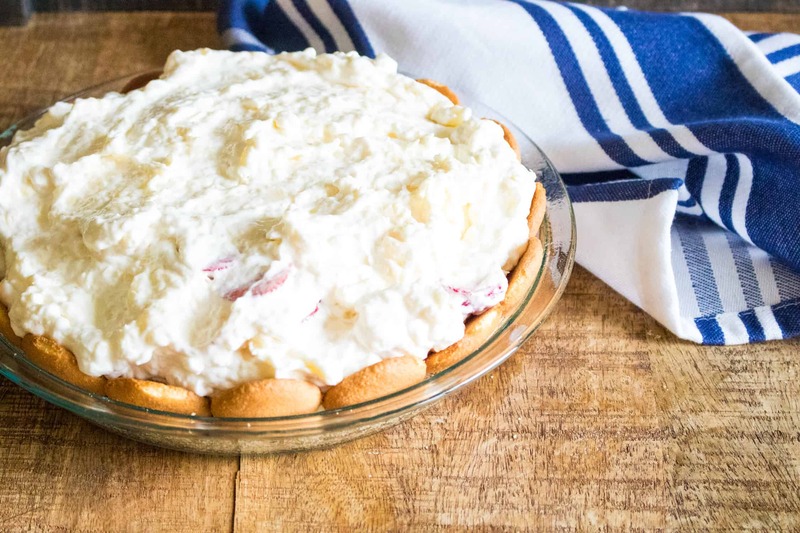 Pull it out of the freezer, slice and savor the cooling combination of frozen fruit and light and airy whipped topping. Because you get to enjoy summer fruit in your dessert. While this recipe calls for canned pineapple, it also includes beautiful, fresh strawberries that are at their peak in the summer. Want to add even more tasty fruit options? Top this No-Bake Tropical Cream Pie with your favorites: kiwis, oranges, mango, peaches. Or, venture into more exotic offerings with slices of carambola (commonly referred to as starfruit) or Pitaya, also called dragon fruit. It is SO easy to make! In the summer there are a million fun activities going on. Who wants to be stuck inside baking? With this No-Bake Tropical Cream Pie you won’t be. 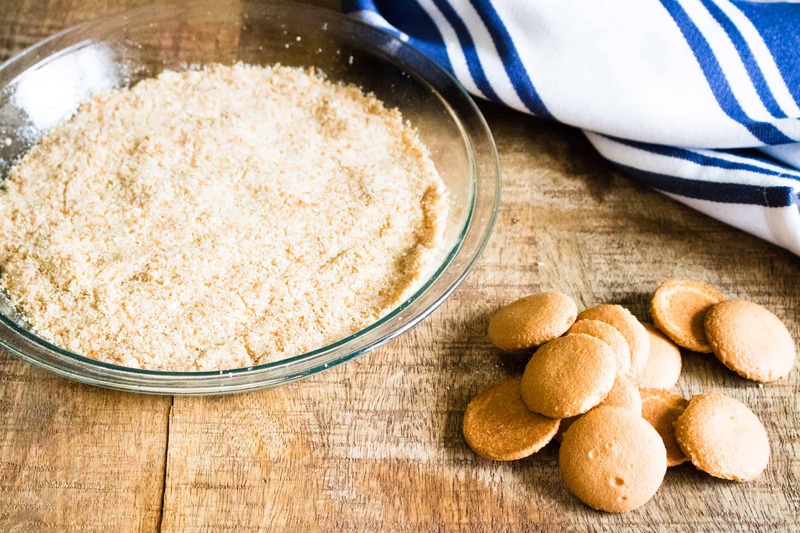 Crush some cookies, press them in the pan, mix the filling and freeze! Then get back outside to enjoy the longer days. Tropical treats are synonymous with summer, which makes this a great dessert to serve throughout the year. It is particularly welcome in the winter months, when a much-needed taste of the tropics will help brighten up those dark and gloomy days. Love Snickers bars? This Snickers Cheesecake Parfait deliciously incorporates them into a fun no-bake dessert. This Banana Cream Dessert that is a great no-bake twist on the classic and beloved banana cream pie. Maybe you like fruit, but you love chocolate! In that case, this No-Bake Chocolate Cheesecake recipe is for you. Step #1: Crush 30 Nilla wafers in a food processor or blender. Transfer to a bowl or pie dish and mix with butter until well blended. Press onto the bottom of a 9-inch pie plate. Step #2: Spread the remaining wafers around the edge of the pie plate. Step #3: In a large bowl, beat cream cheese and sugar together with a hand mixer until well blended. Gently stir in the whipped topping, pineapples and sliced strawberries. Step #4: Spoon topping into pie pan. Step #5: Freeze for 4-6 hours prior to serving. 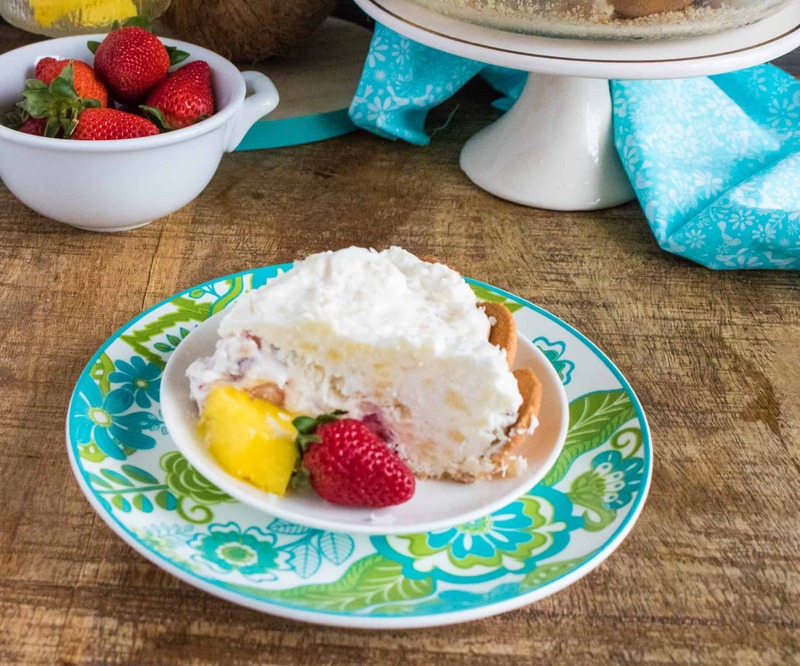 Cool and refreshing, No-Bake Tropical Cream Pie tastes like a little slice of summer! Crush 30 wafers in a food processor or blender. Transfer to a bowl or pie dish and mix with butter until well blended. Press onto the bottom of a 9-inch pie plate. Spread the remaining wafers around the edge of the pie plate. Beat cream cheese and sugar together in a large bowl with a hand mixer until well blended. Gently stir in the whipped topping, pineapples and sliced strawberries. Freeze for 4-6 hours prior to serving.